Those things up there? They’re springy. Stickyish. Sweet and sugared, square and bouncebouncebouncy. Those, my friends, are marshmallows. 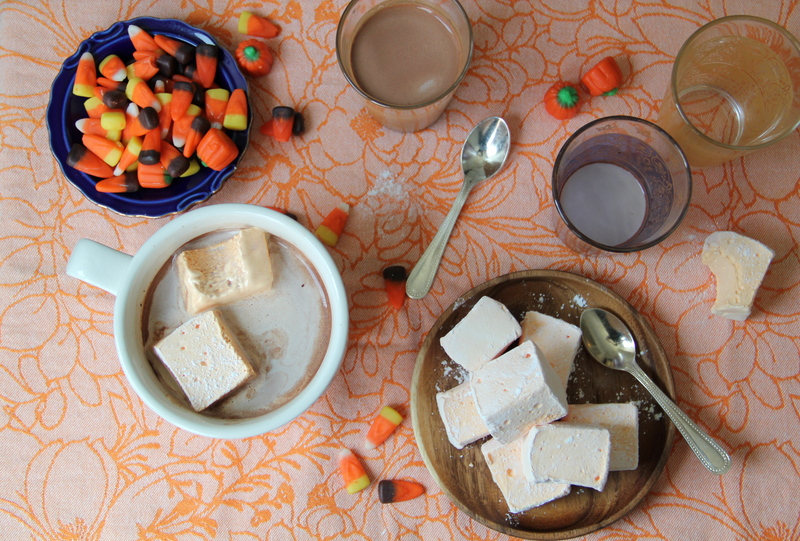 They’re actually Halloween-themed marshmallows, on account of they’re orange. That’s on account of the food coloring which, of course, is on account of the upcoming jack o’lanterned holiday. So, you know. Themes. I’ve been wanting to make my own marshmallows for awhile now. 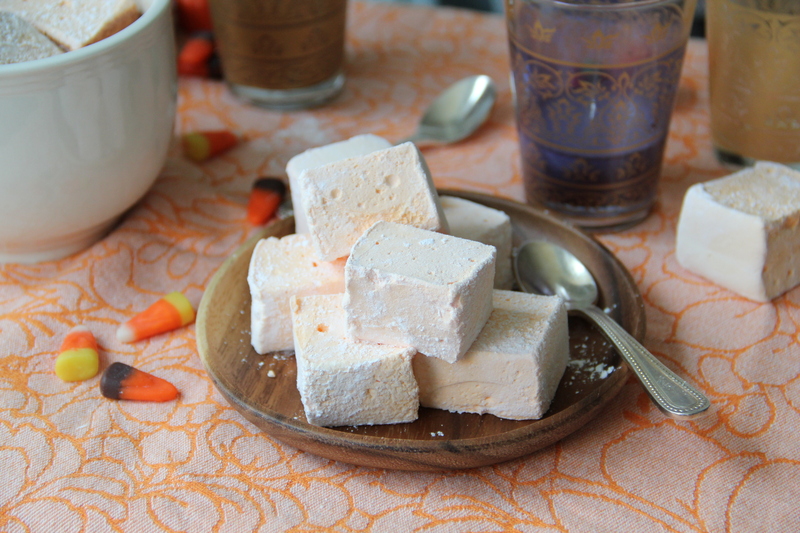 When I worked in the kitchen at Liddabit Sweets, I made marshmallow all the time – sticky, gooey stuff we’d spread as filling for some sick (like, si-hiiiick, in a good way) candy bars, but until now I’ve never tackled the at-home marshmallow set. Now that it’s done, it’s going to be a thing. I’m pretty sure of it. I’ve got long lists of mallowy flavors in my head, so I’m just saying: consider yourself warned. Straight up, while wearing a Halloween costume. S’mored. Toasted black and eaten off a stick. Cooked down with a bit of butter and then swirled into krispies, treat-like. Swallowed whole during a fiery game of Chubby Bunny. 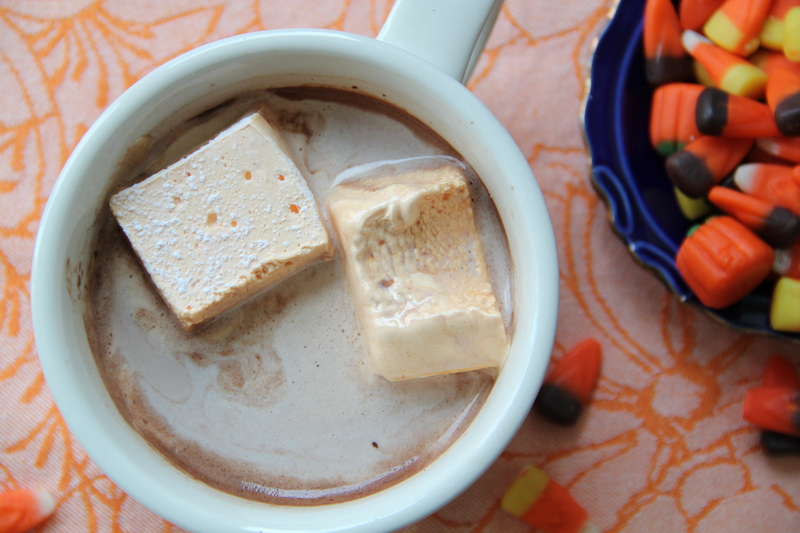 Or else dropped neatly into a mug of smooth, rich hot chocolate, and then swallowed in melted gulps. Whichever way you choose to eat them, remember: these are no puffed-by-a-jet mallow monsters. 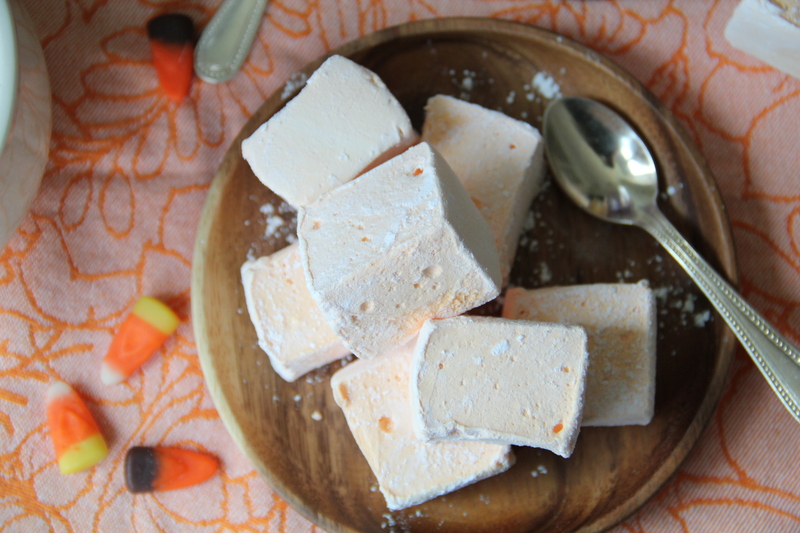 These are sweet, vanilla scented, orange-hued marshmallows, made entirely from scratch. Costume or no, sounds sort of perfect, don’t you think? Once the sugar mixture is boiling, attach a candy thermometer to the side of the pan. Boil the mixture until it reaches 240 degrees F (115 degrees C). Once at 240, remove the pan from the heat and turn your mixer on low speed. Slowly pour the hot syrup, in a thin stream, into the bowl of your standing mixture. Once all of the syrup has been added, carefully throw in your bloomed gelatin (if using powdered gelatin you can skip this step – your gelatin should already be in the bowl of the mixer). Gradually increase the speed of the mixer to high, and beat mixture until it has turned glossy white, tripled in volume and is thick and stiff, about 10 minutes. Add the vanilla extract and food coloring, and beat well to combine. I dont have a stand mixer. Can you make some for me to give to my coworkers and take credit for? yeah totally. sounds like a fantastic deal.